For a moment, if reading this from the perspective of an upper classman, revisit your freshman year and envision some of the anxieties it is possible you felt as an inexperienced freshman in terms of choosing the “right” major, “right” classes, and dreaming of a career that was both attainable and rewarding. According to Dr. Fritz Grupe, founder of MyMajors.com, “it is little wonder 50 percent of [college students] who do declare a major, change majors — with many doing so two and three times during their college years” (as qtd. in Ronan). If you are currently a freshman, like I am, then certainly these concerns have occurred to you once or twice in the last few months. On that note, having only experienced what feels like a brief moment of college life over these couple of months, perhaps the greatest piece of advice I’ve received thus far came from a professor who encouraged his undergraduate students to seek meaning and knowledge in the courses they took, not to choose classes destined to land them a job and a sizeable salary. As much as I intend to avoid “preaching to the choir” (I am clearly not as skilled at avoiding using clichéd phrases in certain blog posts), I think it is fair to say that many of you involved in the Public Relations Student Society of America here at UD, and in the public relations concentration in general understand that it will take time and hard work before landing a so-called “dream job”. This concept is not meant to seem cynical, but to accredit all of us getting involved in PR, we won’t mind beginning with an entry-level job that may not be extremely lucrative if it means we get a shot at working in a field that makes us happy. I say this because, until recently, I was worried that I would not figure out what it is I wanted to do in terms of a career. Then, after getting involved with PRSSA-UD, I found what feels to me like a family of other students who share the same goals and interests. The organization has been such a huge help for me in terms of discovering what the field of public relations is all about, and has been very comforting in giving me the sense that my future holds a space for a potential career in this field. 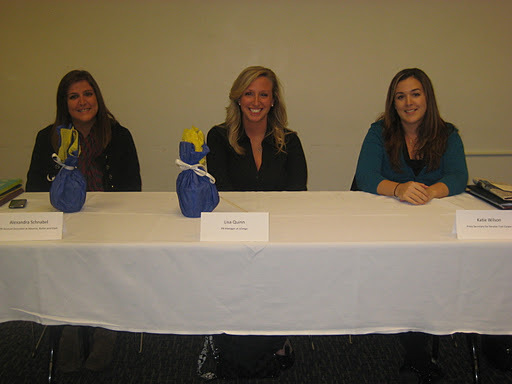 More specifically, on November 10, PRSSA-UD hosted “Night with the Pros”, an event that has really encouraged me to join the field. Three very honest and down-to-earth speakers, Katie Wilson, Lisa Quinn, and Alex Schnabel, gave students a fantastic insight into the world of PR and what their jobs entail on a regular basis. Their generosity in sharing personal stories and advice, as well as their willingness to speak with us afterwards, was really gratifying, and I feel lucky to have heard them speak. Listening to these young professionals helped me begin to understand that the field of PR travels in many different directions, and that it is possible to hone in on a specific skill or interest and still find the area of PR that makes sense to you. All of the speakers acknowledged, as well, that your first job may not be your permanent one, but it is a great way to get “a foot in the door”. Ultimately, I learned from them that your job should make you happy, and should be something you love to do. Financial stress may be present early on, but with enough hard work and dedication, the job of your dreams will find its way to you.